How many people are employed by the Disneyland Resort in Anaheim, California? 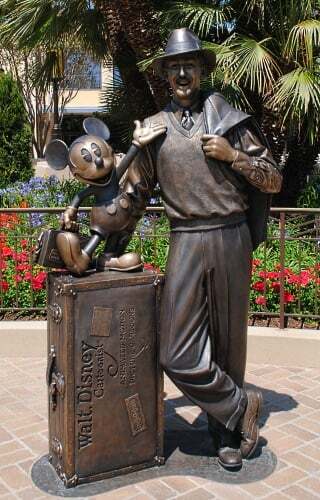 This statue at the center of Disney California Adventure’s new Buena Vista Street depicts a young Walt Disney when he first arrived in Los Angeles with nothing but a cardboard suitcase and $40 in his pocket. Since 2010, Disney California Adventure has undergone a transformation, with the addition of the “World of Color” nighttime show, Ariel’s Undersea Adventure ride, the newly redesigned entry – Buena Vista Street, and the opening of Cars Land. These additions have meant an addition of 3,000 Disney cast members, making Disneyland Resort is the largest single-site employer in Orange County with c) 23,000 employees. I have always been a big fan of Disney California Adventure Park, even before all of these glorious changes. Bug’s Land is a blast for my two young children who can ride on four sweet rides with typically a minimal wait. One of my all-time favorite Disney rides is located at this park: Toy Story Mania, which opened in 2008 on Paradise Pier. Now, Radiator Springs Racers in Cars Land has been added to my personal list of the top three best Disney rides (along with the classic Space Mountain over in Disneyland). What is your favorite Disney California Adventure ride or attraction? Let us know in the comments! Home » BLOG » How many people are employed by the Disneyland Resort in Anaheim, California?